Qatar asked for clearance from the U.S. Government to purchase 72 F-15E Strike Eagle derivatives, but the request has been slow-rolled. Now, almost two years later and after the Iran Nuclear Agreement has been implemented, there are high hopes the deal may finally be allowed to move forward. Considering that Qatar remains a close ally of the U.S. in the region, and their fighter business has traditionally gone to European manufacturers, penning a deal for dozens of F-15 Strike Eagles seems like a no-brainer. Yet, politically, this would seem not to be the case. Aside from Israel and Saudi Arabia, which have long been opposing regional super-powers that the U.S. has aimed to carefully counter-balance when it came to military capabilities, it seems as if major U.S. fighter aircraft deals with Arab states have been held back over the last couple of years. Even Kuwait, with its relatively tiny air force and recent history of invasion, has requested 28 Super Hornets to help augment, and eventually replace their aging F/A-18C/D Hornet fleet of a similar size. Strangely, this deal has also been put on the back burner. Kuwait’s close proximity to Iran, especially much of its oil exporting apparatus, and the Super Hornet’s well-proven advanced capabilities likely kept it from being exported to the tiny oil-rich Sunni nation during the nuclear talks with Iran. The Strike Eagle’s ability to carry a heavy weapons load—and fly over long distances and at extremely low-level if need be—would have posed a threat directly to Iran. The Israeli Air Force operates all models of the F-15, including the F-15I derivative of the Strike Eagle, which is about to get major upgrades. In addition, Israel recently requested more new-build advanced F-15 Strike Eagle derivatives. Although, not all Eagles—or any fighter export, for that matter—are equal. Often times certain systems are removed or degraded in order to meet America’s grand strategy for the region. But even in a dumbed-down form, the Strike’s range and interdiction capabilities give even small air forces serious reach and a hard punch. With this in mind, holding back the sale was likely viewed as a way not to complicate what was already a hugely complex set of negotiations. The withholding of what some would say are critical arms technologies and capabilities to traditional American allies is not a new concept, especially for the Obama Administration. Most famously the Obama White House controversially blocked the sale of new-build advanced F-16s to Taiwan, instead agreeing to upgrade their aging F-16A/B models to a similar avionics standard. This decision was wrought with political infighting and accusations that the Obama Administration had moved from seeking a strategic balance in the region to outright “appeasing” China. The reality is that we can only expect these allies and potential customers to be so patient. There is an arms race brewing in the Middle East as clearer lines become drawn between the Sunni Arab states and Iran along with their proxies. An open conflict is already underway in Yemen split along these exact lines, and after the ransacking of the Saudi Embassy in Iran following Saudi Arabia’s execution of well-known Shiite cleric, hostilities have drastically increased. There is also the issue of the huge sum of money that Iran will have unlocked now that the nuclear deal has been fully implemented. Estimates range between $55 billion and $100 billion in unfrozen funds that can now be used by Iran to rebuild its largely antique weapons inventory and fund proxy wars around the region. Additionally, Iran will now be able to freely sell oil on the open market, which will mean more income to the Iranian government and potentially even more crude oil inventory being tossed onto the world market which could negatively effect already shattered prices. This is something the increasingly economically battered Sunni Arab gulf states would detest. All of these factors have drastically increased the demand from Sunni prominent Gulf States for high-end conventional arms. Beyond European weapon manufacturers willing to fast-track purchases from these countries, Russia also seeks a greater market share in the region. Egypt is already executing large buys of Russian fighters and attack helicopters, and Russia will have a much stronger presence at this year’s Bahrain Air Show in hopes of hawking its latest Flanker derivatives that have been at work in Syria. Algeria, although not a Middle Eastern country, is in the process of ordering the export derivative of the medium-range Su-34 Fullback fighter-bomber, dubbed the Su-32. Although closely manipulating weapons sales to a region has been an established form of implementing a larger U.S. foreign policy strategy, this type of strategic engineering can only go so far when those being affected by it can simply turn to another, much less constrained weapons vendor for their needs. This is already happening, as Qatar also ordered a couple dozen Rafale fighters from France. Kuwait is closely eyeing Eurofighters, and may end up buying both those and Super Hornets in a split-buy scheme. If the requested orders for Super Hornets and Eagles do get fast tracked, they could represent a saving grace for Boeing’s tactical aircraft production line in St. Louis. It is currently facing the potential end of both Super Hornet and Strike Eagle production around the end of the decade. 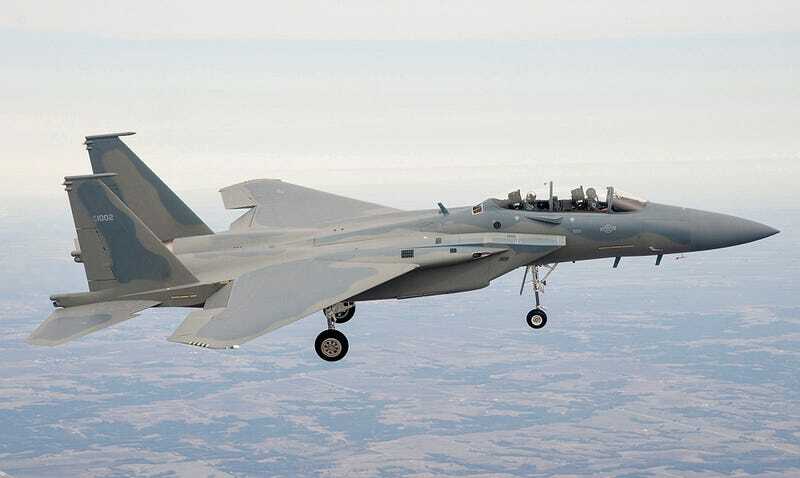 This, along with the loss of the Long Range Strike Bomber contract, and if it loses the USAF’s replacement trainer contract known as the T-X, it could mean an end of that business sector for Boeing altogether. The idea that 100 more Boeing fighters have been requested from our allies two years ago and not signed off upon by the government makes for a pretty terrible scenario for Boeing and many of its workers in St. Louis. But, if these orders alone are approved soon—not to mention the potential orders from other countries—and before Qatar and Kuwait step away from the table fully, it would mean both lines will most likely exist past the turn of the decade. It would also mean that the U.S. will continue to produce multiple alternatives to the Joint Strike Fighter well past its supposed initial operating capability milestones.